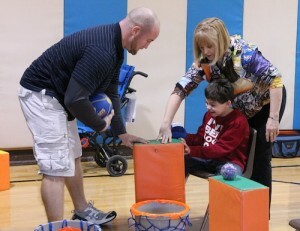 Ryan O'Connor participating in an adapted sport activity with physical education instructor Jim Hintenach, left, and occupational therapist Deborah Goodhart. Last year the Immaculate Conception School in Annandale, NJ, designated Matheny as the beneficiary of its Dance-A-Thon and raised $10,000. This year, ICS has formed a fundraising team to support Miles for Matheny and has set a fundraising goal of $15,000. The effort is being coordinated by Debbie O’Connor, an Annandale resident whose nine-year-old son Ryan is a student at Matheny. Confirmation candidates will receive service hours for volunteering to push a Matheny student or patient, but O’Connor added that ICS students might choose to volunteer with their family to push one of the wheelchair participants. “It is an amazing experience,” she said, “that will touch your hearts.” It will be easy to spot the Immaculate Conception volunteers because O’Connor is having t-shirts made specifically for Team ICS. In addition to the Wheelchair Walk, activities at Miles for Matheny will include a 5K Race, five different Cycling routes, a Kids Fun Run and The Friends of Matheny’s “Breakfast of Champions, followed by luncheon refreshments in the park. All funds raised will help support the Matheny Center of Medicine and Dentistry, which provides medical, dental and therapy care to people with disabilities in communities throughout New Jersey. Major sponsors include: the Poses Family Foundation, title sponsor; Partlow Insurance Agency; Peapack-Gladstone Bank; Porzio Bromberg & Newman, P.C. ; Affinity Federal Credit Union; and WCBS-TV and WCBS Newsradio 880. To find out how you can be part of this fun and uplifting event, log onto www.milesformatheny.org or call (908) 234-0011, ext. 260. To help support Team ICS, click on Search for Participant and type in the team name. This entry was posted in Uncategorized and tagged Immaculate Conception School, Miles for Matheny, O'Connor. Bookmark the permalink.